The delicate task of ringing at least 10 young ospreys of Kielder Water and Forest Park is underway, carried out by experts from the Forestry Commission. This important task helps the team at the Kielder Osprey Project to monitor the birds’ progress and is helping keep track of the recovery of ospreys in England. This year has been another hugely successful one for the Kielder Osprey Project. Four chicks hatched on Nest 1A, a 1 in 100 chance of occurrence and one of only three “public” osprey sites with four chicks being reared in the UK. The “awesome foursome” were the first to be ringed and all were in very good health for such a large brood. This rare occurrence was in addition to the establishment of a new nest site in Kielder. The team is delighted with the new nest, which uses one of several nest platforms set up by the Forestry Commission’s wildlife team to provide ospreys with a place to breed. Ringing the chicks allows ecologists to examine the health of the five to six week old birds and make various checks and measurements. The chicks are not small - with a wingspan of about one metre - and the ringing is carefully managed under license. One chick will be fitted with a satellite tracker, a tiny backpack which sends information via the mobile phone network. This provides significantly more effective monitoring of the birds than by ringing alone. This year, the project has been closely monitoring the satellite tracker of “UV”, born at Kielder in 2014. The information on his journey back to the UK is providing a fascinatingly detailed insight into the osprey migration journey and travels to identify potentially good fishing areas, the first step in establishing his own territory. The process of ringing and tracking provides ecologists and ornithologists with detailed information on subjects such as migration and feeding behaviour. It is a brief and painless but a key moment in the early lives of the osprey chicks; a species which only returned to Kielder in 2009 after an absence of more than 200 years. “Ospreys are a fascinating species and I am delighted our work is helping their continued recovery in northern England and southern Scotland. As Kielder Water and Forest Park ages, it is becoming more diverse and ospreys are a great illustration of this natural succession, delighting visitors to the area”. Visitors to Kielder Water and Forest Park can visit Osprey Watch, to keep up to date with the birds’ progress. 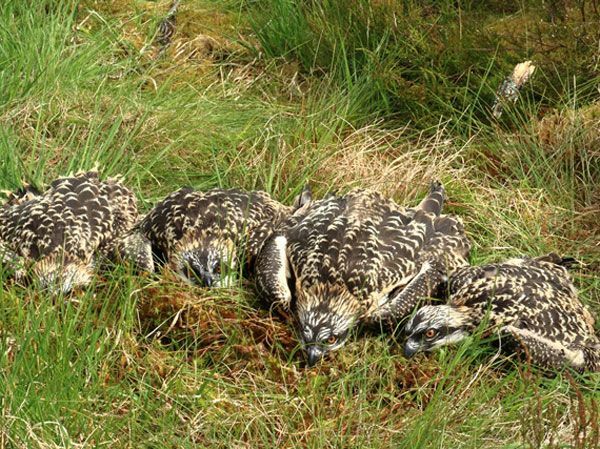 Kelly Hollings, Northumberland Wildlife Trust Estates Officer for Kielder, who works with the Osprey Watch team said, “Ringing is a momentous moment in the lives of these fabulous young birds. We have had hundreds of visitors coming to the Osprey Watch at Northumbrian Water’s Leaplish Waterside Park to see and hear about the ospreys from the expert volunteers. “The progress of the Chicks has been seen by many others via the live camera feed into Kielder Castle Café, where visitors have enjoyed the local food while watching the screen. Kielder Osprey Watch 2016 continues to run every weekend between 10.30am and 4.30pm until the chicks fledge in August, behind the Boat Inn restaurant at Leaplish Waterside Park. It will also be open on Wednesdays from 6 July.